Biological diversity is exuberantly displayed through the world of orchids. They are so beautiful, varied colours, shapes, and sizes that they are renowned and treasured around the world. Ecuador boasts the highest orchid diversity of any country in the world with more than 4,200 species documented, ( 20% of all species in the world ) and new species are still being discovered. While orchids grow in each of the four ecosystems in Ecuador, the majority are found in the rain & cloud forests. Wild orchids may be seen almost year round of course the species varying with the elevation and wet or dry season. Southern Ecuador, from Cuenca to south of Loja, is considered the country's top orchid growing region due to soil, moisture and elevation conditions. On the equator, the optimum elevation for orchids is 600 to 2,800 meters, although they have adapted to grow in almost every habitat on the planet. Long time fans of nature's beauty, as displayed through orchids, we have gone from struggling to keep several species alive in our Canadian home, to enjoying a bountiful display both within our equitorial home, and within the country. i.) Ecuagenera, one of the world's largest growing operations with over 6,000 varieties, and a major exporter is located between Cuenca and Gualaceo. ii.) 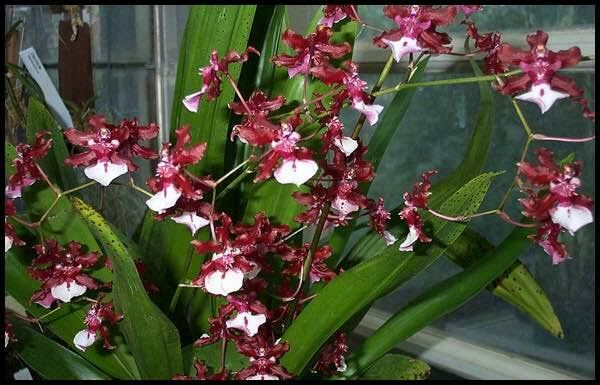 November 2014 - 4th annual Cuenca International Orchid Show at the Mall del Rio convention center featured orchid exhibits from Ecuador, Taiwan, Japan, Italy and the U.S. iii.) The University of Cuenca has an Orchidarium, with over 360 different varieties of orchids. The greenhouse displays are organized by the varying climate zones. Open Monday thru Friday 8am to Noon and 2pm to 6pm the best time to visit is May through December. iv.) In Quito's Parque La Carolina is the Botanical Garden of Quito which features an 800 sq mt orchid conservatory. Separate greenhouses distinguish the coastal, sierra, and amazonas varieties. Open daily from 8am to 5pm there is a nominal admission fee. v.) Several hours north of Quito in the cloud forest in Mindo is Jardin de Orquideas. vi.) The city of Loja has a small but worthwhile orchid nursery in La Banda Park – adjacent to Jipiro, and behind the city zoo. vii.) National Orchid Exhibition at the Smithsonian Institute. You may never get to see many of the wild species as they grow high up in the canopy of tall tropical trees. But one of "must see" species is the rare and unusual Monkey Orchid. It can only be found in the high elevations of Ecuador and Peru. Another rare specimen is the Devil or Dracula Vampire. This orchid is known as chocolate for its delicate chocolate fragrance. Just a few kilometers south of Puyo an Orchid & Botanical Garden Centre for the Amazon. Ecuador Boutique Travel offers a suite of orchid tours nationwide with specialized guides. Their orchid tours are oriented toward both research and recreation throughout the country. Metropolitan Touring offers multiple tours aimed at visitors who want to admire Ecuador orchids. They specialize in the areas of Mindo and Tulipe (cloud forest), Papallacta (high montane forest) and Antisana (Andean moorlands or paramo), with programs originating in Quito of one to two days. San Jorge Eco-Lodges & Botanical Reserves offers two- and 6-day orchid tours which take you to Quito's Botanical Gardens, El Pahuma Orchid Reserve, San Jorge de Tandayapa Hummingbird Sanctuary and the Mindo Loma Orchid Garden, as well as many other hotspots. Orquideas de Los Andes specializes in customized orchid tours. With over 20 years experience, tour operator Eduardo Sanchez offers personalized trips where you can view of hundreds of species of Ecuadorian orchids. Hi Cher, so glad you enjoyed ! Take good care and we will see you soon.